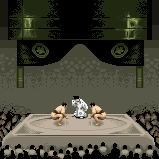 Kokugikan Arena (in Japanese: 両国国技館; Rōmaji: Ryōgoku Kokugi-kan) is a sporting arena in Tokyo, Japan. It is mainly used for sumo wrestling tournaments. During the events of the game Mario is Missing!, a Sumo Apron of one of the wrestlers was stolen by Koopa Troopas. Luigi, when he visited the city, had to find and return it to the arena. He was rewarded 1,040 dollars upon doing so. Sumo wrestling has been a popular art form and sport since the 6th century, when it originated in Shinto temples. Wrestlers begin training in their early teens with endless practice, strenuous exercise and lots of special foods. The men must reach an enormous size, 250 to 375 pounds. The aim of a match is to force your opponent out of the ring, or to force him to touch the clay surface with any body part besides a foot. The wrestlers appear first in the heavily embroidered aprons donated by dedicated fans, and then strip down to skimpy loincloths. This page was last edited on March 29, 2018, at 18:35.